High density polyethylene Dewar Flask with vented and insulated HDPE covers. They are unbreakable, chemically resistant, and withstand temperatures from -196 to 100°C (-321 to 212°F). Double walls are filled with foamed urethane to minimize heat exchange. 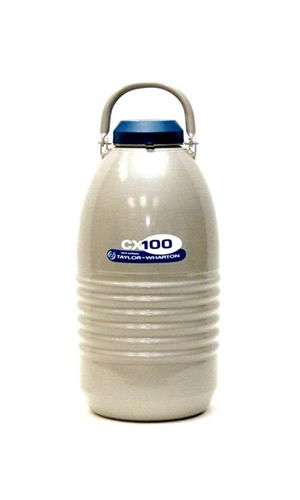 May be used for short term storage of dry ice-solvent, liquid nitrogen, or for use as a hot bath. 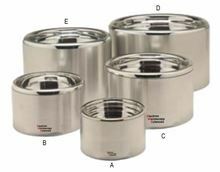 They are ideal for storing frozen biological specimens. 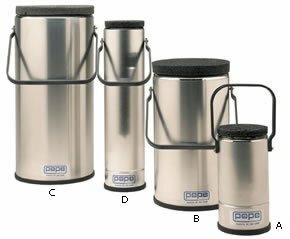 All available sizes feature molded-in-ribs for stability and a carrying handle on the 1, 2, and 4 liter sizes. These foam dewars are safe, durable, and have superior insulating properties compared to stainless or glass, at a fraction of the cost! Foam dewars use fine closed cell foam for insulation, which is chemically inert and mechanically durable enough to be exposed directly to liquid nitrogen, without leaking or degrading. Also, due to the lower thermal mass, foam vessels cause less liquid nitrogen boiloff when filled, and will accumulate less frost. This results in less liquid nitrogen being used. All vessels feature a foam lid. Lab grade dewars. Made from borosilicate glass and vacuumed to 10-7 torr, without pads between walls, eliminating heat transfer for maximum efficiency. They come with low evaporation stopper and weighted base. Metal Casting does not extend the full length of the flask. 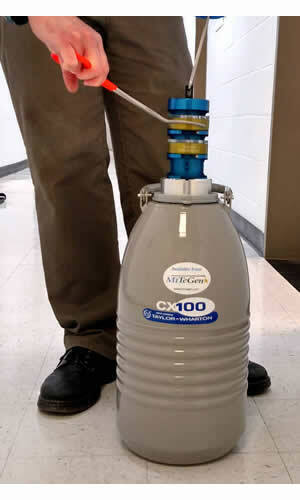 Florence flask design, offers the most efficient way of holding liquid nitrogen. 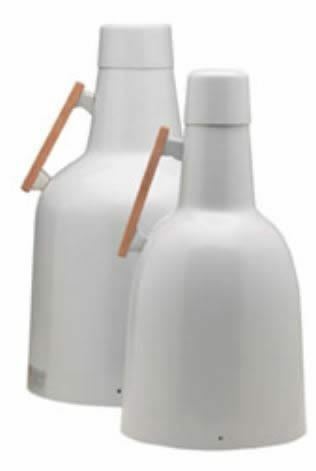 Available with an optional Fiber Glass Caddie for safety, easy carrying, and decanting liquids from the above flasks. Low Form Shallow Dewars permit essential operations that are not practical with standard cylindrical or spherical Dewars. The protective aluminum bases on both the hemispherical and cylindrical dewar styles extend the full height of the Dewars. Note that protected vacuum tip-off tubulations are offset to the side to minimize space between the Dewar bottoms and magnetic stirrers. 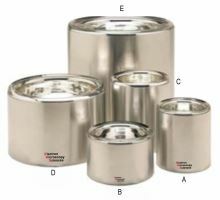 The hemispherical line has been expanded to provide additional Dewars to fit larger flask sizes. These lab grade dewars are rated the most efficient glass Dewars in the World! The superior ranking is due to the rigid quality control when manufacturing, along with superior design and manufacturing features. The protective aluminum bases on both styles extend the full height of the Dewars. All Wide Mouth models can be obtained with an exterior metal housing that extends nearly to the top rim of the Dewar (a slight extension of the glass Dewar facilitates pouring). This housing adds the safety of metal to the efficiency of glass, particularly important in handling operations. Lab Grade Dewars with a narrow mouth are ideal for temporary storage or for room-to-room transfer. 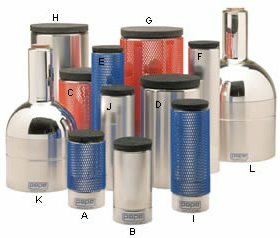 Standard features include low evaporation cork stopper, fully shielded evacuation tip, weighted bases and partial aluminum base. All Lab Grade Dewars are manufactured of borosilicate glass for liquid nitrogen service. A sturdy mesh cover facilitates a firm grip, provides a cushion against bumping and increases protection. 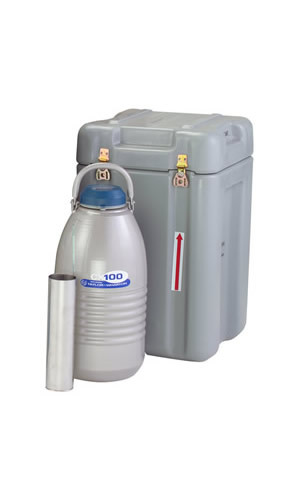 This handled Dewar vacuum flask is perfect for temporary storage and liquid gas service, especially Liquid Nitrogen. 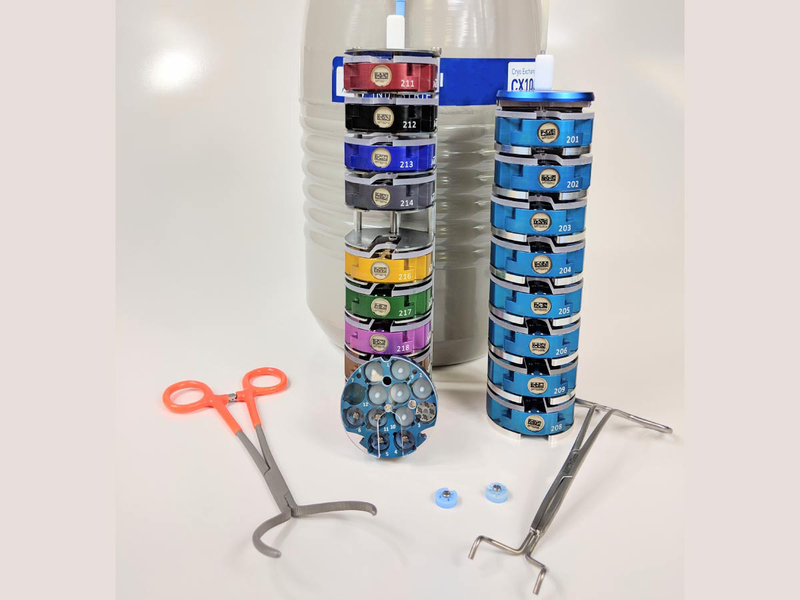 With a wide-mouth design and a fully silvered borosilicate glass inner flask, it incorporates the convenience of a coated handle and full aluminum base on the most popular cylindrical model sizes from the Lab Grade line. All models use fitted polyethylene caps for extended holding. 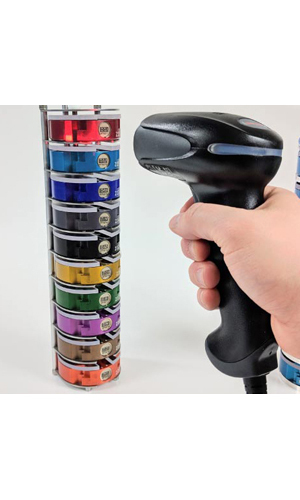 Lightweight and sturdy, the Caddie for Part Numbers 61888-11 and 61888-12 now comes in Aluminum. These prove ideal for local carrying or decanting Lab Grade Spherical Dewars. They can be used repeatedly by simply removing bottom retainer, inserting a new Dewar, and replacing the retainer. Gaskets help center Dewar and hold it firmly in place. The aluminum top snaps into place. Lab Grade Dewars are supplied with stoppers for both the wide mouth and narrow mouth cylindrical Dewars. Need another one? 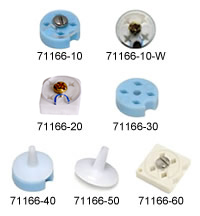 Replacement stoppers can be purchased separately. Use the Dewar model number to identify the stopper you need. 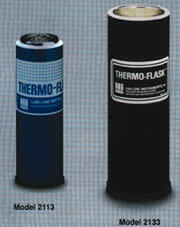 Thermo-Flask provides safe extended temperature retention for specimens stored in liquid nitrogen or solid CO2, and thus have a broad range of applications in industrial, educational, and clinical fields. Thermo-Flask features borosilicate glass inner liners which have been evacuate to 1x10-5 mm of Hg to provide maximum coolant retention. Without lids and carrying handles. The following model includes a lid and handle. Aluminum canes hold vials for freezer storage or immersion in LN2 Dewar. For use in liquid phase, use approved vials only. 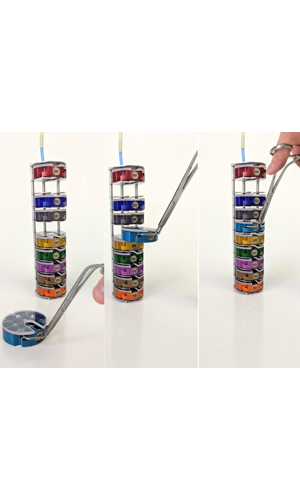 Canes bend to fit all major cryogenic vial brands. Made from aluminum, 11-5/16" (28.7 cm) long. 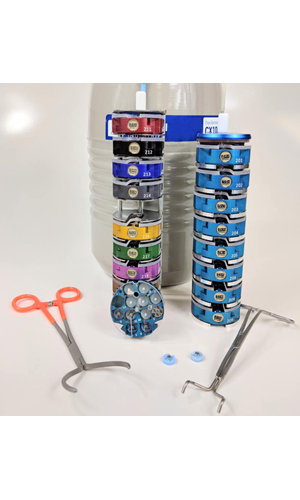 Firmly holds most Cryo Vials for liquid nitrogen storage. It stores up to 6 standard cryo vials. Clear polyvinyl chloride. 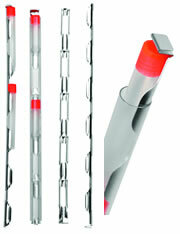 Ideal for enclosing Cryo Storage Canes for extra security during handling and storage. Fits over most other canes. Will not become brittle during freezing or thawing. Will not shred or tear after repeated use like cardboard. Length: 10-13/16" (27.5cm L). These specimen grid boxes are tools for storing or transferring cryogenic TEM specimen grids. 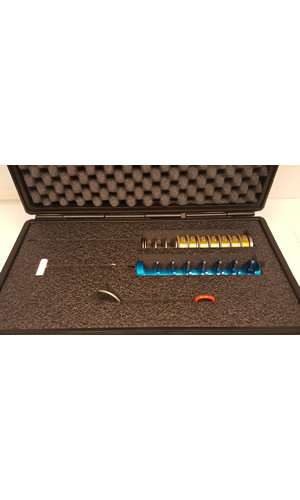 Use this tool to open the lid of our cryogrid box (EMS Cat. #71166-40). 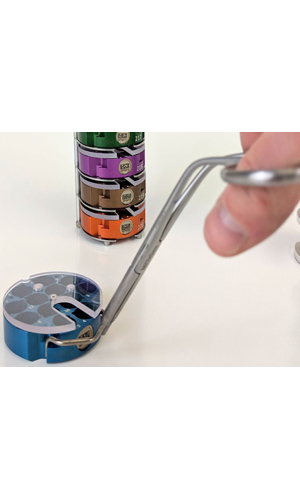 It features a spring loaded vise that grips the lid securely and a ribbed barrel for ease in unscrewing the lid. Made of high quality aluminum, it can be used with liquid nitrogen. Can also be used to carry the cryo grid box. 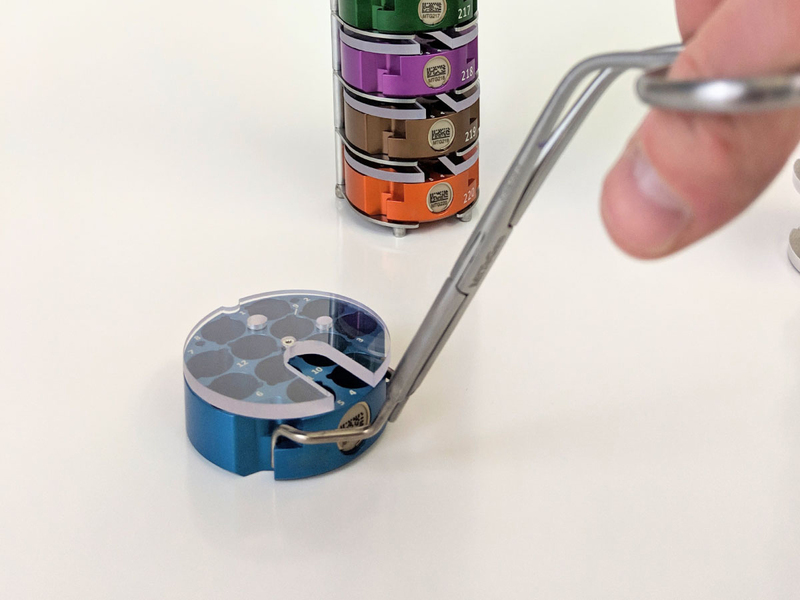 This tool has one end which is threaded and fits into the center hole of the Cryogenic Grid Storage Box (where the screw goes in to secure the lid) for moving the box in and out of the cryogenic chamber. This special Filter Paper has an outer diameter of 55 mm, with an inner diameter of 20 mm. Made from Grade 595 paper. Made from brass, these planchets are used for high pressure freezing. 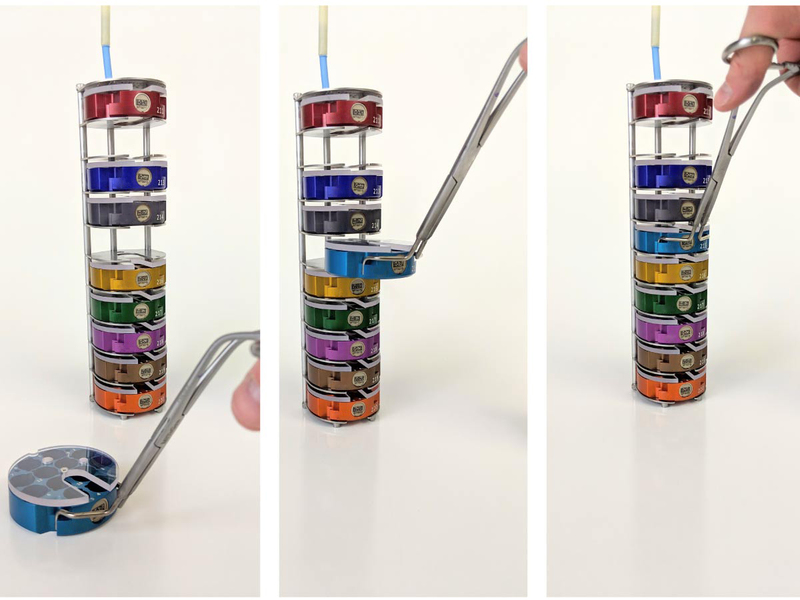 They are able to be stacked, allowing for greater depth. 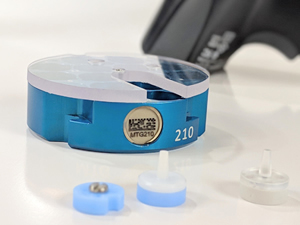 The measurements of the planchets are as follows: Planchet A has 2 chambers at 0.1mm deep and 0.2mm deep. 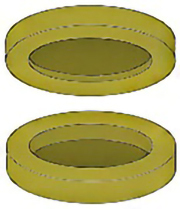 Planchet B has 1 chamber at 0.3mm deep. 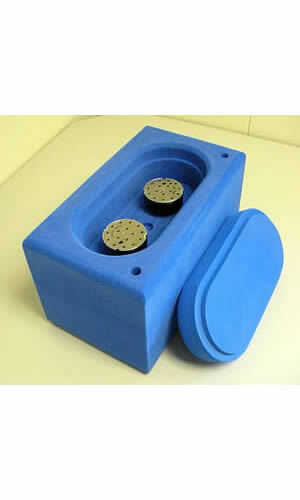 These disposable plastic Cryomolds produce a uniformly shaped flat surface specimen block with tissue freezing medium (O.C.T.) 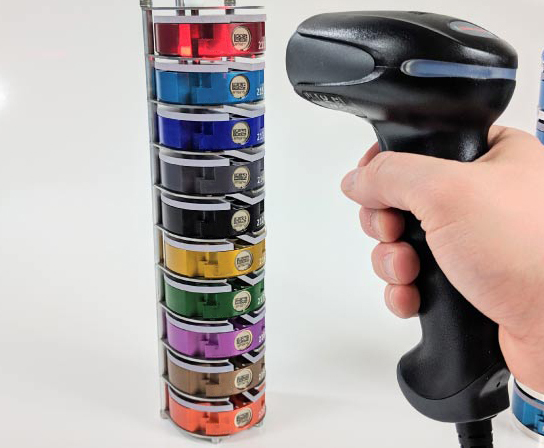 for frozen sectioning, Standard Cryomold fits directly into Cryobar® freezing wells of the Tissue-Tek® II microtome/cryostat. Use a Cryomold® adapter to adapt smaller biopsy and intermediate Cryomold® molds to freezing wells on the Cryobar® unit.